- WCCW Parade of Champions (June 24, '72) = Mascaras won over the Alaskan. - Tokyo Sports All-Star Dream Card (August 26, '78) = Mascaras, Jumbo Tsuruta, & Tatsumi Fujinami beat Masa Saito, Akihisa Takachiho, & Tiger Toguchi. - AJPW Real World Tag League '79 (November/December) = Mascaras & Dos Caras competed in the league, which was won by Terry & Dory Funk Jr.
- AJPW Sumo Hall (December 13, '79) = Mascaras & Dos Caras fell to Giant Baba & Jumbo Tsuruta. - AJPW Sumo Hall (October 9, '81) = Mascaras defeated Mighty Inoue. - Mid-South Superdome Extravaganza (November 25, '82) = Mascaras & Chavo Guerrero Sr beat Tully Blanchard & Gino Hernandez. - AJPW Heavyweight Battle Royal '83 (January 2) = Mascaras won the Battle Royal. - Mid-South Superdome Extravaganza (July 16, '83) = Mascaras & Tim Horner won over Boris Zuhkov & Mr. Olympia. 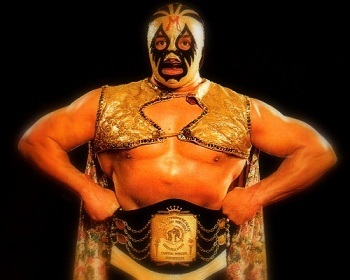 - WWC 10th Anniversary Show (September 17, '83) = Mascaras & Dos Caras defeated the Infernos. - AJPW Real World Tag League '83 (November/December) = Mascaras & Dos Caras competed in the league, which was won by Bruiser Brody & Stan Hansen. - AJPW Sumo Hall (December 12, '83) = Mascaras & Dos Caras beat Ron Fuller & Barry Windham. 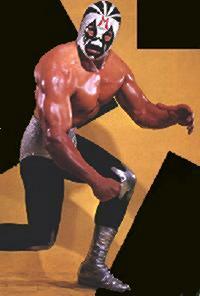 - AWA SuperClash (September 28, '85) = Mascaras retained the IWA Heavyweight Title, taking down Buddy Roberts. - AJPW 13th Anniversary Show (October 21, '85) = Mascaras & Art Cruz fell to Riki Choshu & Yoshiaki Yatsu. - AJPW Budokan Hall (June 12, '86) = Mascaras, Harley Race, & Shunji Takano defeated Tiger Mask, Mighty Inoue, & Hata. - WCCW 4th Von Erich Memorial Parade of Champions (May 3, '87) = Mascaras pinned Al Madril. - WWF Paul Boesch Retirement Show (August 28, '87) = Mascaras & Tito Santana won, via DQ, over Demolition. - WCW Clash of the Champions X (February 6, '90) = Mascaras pinned Cactus Jack. 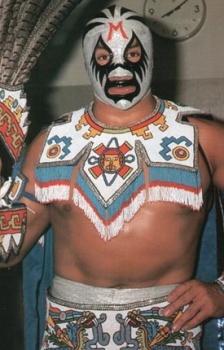 - UWA 16th Anniversary Show (January 27, '91) = Mascaras, Dos Caras, & El Canek took down Kokina, Fatu, & Samu. - WAR Sumo Hall (December 15, '93) = Mascaras beat Gran Markus Jr.
- WAR 3rd Anniversary Show (July 7, '95) = Mascaras, Bob Backlund, & Jimmy Snuka defeated Hector Garza & the Eliminators. - Michinoku Pro 3rd Anniversary Show (October 10, '96) = Mascaras Tiger Mask, & the Great Sasuke were beaten by Dos Caras, Kuniaki Kobayashi, & the Dynamite Kid. - WWF Royal Rumble '97 (January 21) = Mascaras competed in the Royal Rumble, which was won by Steve Austin. - WWC 25th Anniversary Show (August 1, '98) = Mascaras fought to a Double Disqualification with the WWO Intercontinental Champion, Pierroth Jr.
- AJPW Tokyo Dome (January 28, '01) = Mascaras & El Hijo del Santo beat Arkangel de la Muerte & Blue Panther. - AJPW Prefectural Gym (July 17, '02) = Mascaras & Dos Caras won over Yoji Anjoh & Abdullah the Butcher. - AJPW Budokan Hall (July 20, '02) = Mascaras, Dos Caras, & Keiji Mutoh beat Gran Hamada, Gran Naniwa, & Abdullah the Butcher. 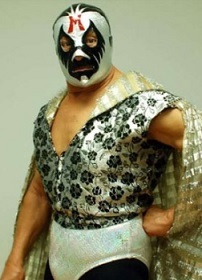 - Hustle 1 (January 4, '04) = Mascaras, Dos Caras Sr, & Sicodelico Jr defeated Steve Corino, Tom Howard, & Dusty Rhodes. - Wrestle-1 Sumo Hall (August 4, '05) = Mascaras & Terry Funk took down Tomoaki Honma & Katsuhiko Nakajima. - Toryumon Mexico Dragon Mania II (May 13, '07) = Mascaras, Marco Corleone, Kazuchida Okada, & Ultimo Dragon defeated Ultimo Guerrero, Minoru Suzuki, Yoshihiro Takayama, & Suwa. - Todo x el Todo (December 8, '07) = Mascaras & El Fantasma beat Dos Caras Sr & Tinieblas Sr.
- WWE WrestleMania XXVIII (April 1, '12) = Mascaras was inducted into the WWE Hall of Fame.